In 1959, when I was 11, I started collecting comic books. An older friend introduced me to the hobby and to the wonderful world of DC Comics — Batman, Superman, The Flash, Green Lantern, Hawkman, Superboy, Aquaman (that’s right, I read the infamous A-Man), Atomic Knights, Rip Hunter, Challengers of the Unknown, and on and on. It was a magical world filled with easily identifiable white hats and black hats. They were entertaining, exciting and, in 1959, comics were still ten cents, 10 for a dollar. Collecting comics was my secret of all secrets. My mother hated it, my father ignored it and most of my friends had no idea. I stored each set of comics, (all my issues of Batman, for example) in a plastic bag originally holding hamburger buns. I kept them on the top shelf of my closet to keep them safe from my mother who was not above tossing out an errant comic lying on the floor. I kept her at bay by keeping my room neat as a pin. Had it been known that I collected comics, my life would have been more miserable than it normally was. So not talking about it was the easiest way. As an example of how secret I kept it, when Jean and I married in 1967, I carried two large cardboard boxes of comics into our new apartment and stowed them on the closet’s top shelf. As it turned out, she became a huge Silver Surfer fan. When, in 1962, writer Stan Lee and artists Jack Kirby, Steve Ditko and a platoon of others began transitioning Marvel Comics from inane monster books to the now iconic Fantastic Four, Incredible Hulk, Spiderman, Iron Man, The Avengers, The X-Men and scores of other comics and characters, I was happier than a fox in a hen house. Along the way, I enticed my younger friend Bob to start collecting and he had quite a nice assortment by the time he started college. Unfortunately, while he was at school, his younger brother destroyed his collection. It was a sad and bitter time. I continued to collect, luring my sons into the hobby. Then in December 1995, I quit. At the time I was buying my monthly titles from a comic shop in Aurora run by Joel, a young man I had known for several years. When I went in that last month, he told me he was closing. In an attempt to take-over the market, Marvel had become its own highly inept distributor. My friend’s monthly orders had been so fouled up, he lost much of his clientele. I haven’t seen Joel since then and in fact, of the 11 different comic shops I routinely patronized, only one survives today and it’s not a friendly environment. The plethora of movies and TV shows that Marvel and Warner Brothers, owner of DC Comics, are putting out is damned exciting for an old geek like me. 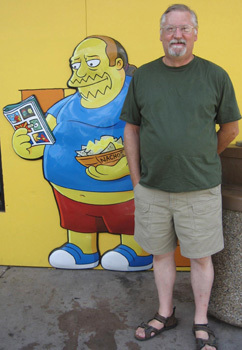 (I differentiate myself from the so-called Fan Boy crowd that is filled with whiny twerps epitomized by The Simpson’s Comic Book Guy, shown above.) I miss collecting on the one hand, but on the other hand, I look back with fondness on the time I spent with my fellow collectors here in Denver. While we’ve all gone our separate ways, there for a few years we talked a lot of geek-speak while guzzling a goodly amount of beer and sharing more than a few laughs.